His award-winning books have won the praise of The New York Times and Gourmet magazine as well as such culinary luminaries as chefs Daniel Boulud, Jeremiah Tower, and Alice Waters. 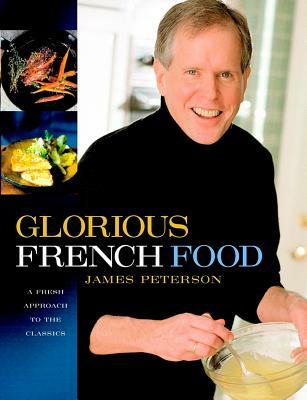 Now James Peterson brings his tremendous stores of culinary knowledge, energy, and imagination to this fresh and inspiring look at the classic dishes of French cuisine. With a refreshing, broadminded approach that embraces different French cooking styles-from fine dining to bistro-style cooking, from hearty regional fare to nouvelle cuisine-Peterson uses fifty "foundation" French dishes as the springboard to preparing a variety of related dishes. In his inventive hands, the classic Moules a la mariniere inspires the delightful Miniature Servings of Mussels with Sea Urchin Sauce and Mussel Soup with Garlic Puree and Saffron, while the timeless Duck a l'orange gives rise to the subtle Salad of Sauteed or Grilled Duck Breasts and Sauteed Duck Breasts with Classic Orange Sauce. Through these recipes, Peterson reveals the underlying principles and connections in French cooking that liberate readers to devise and prepare new dishes on their own. With hundreds recipes and dazzling color photography throughout, Glorious French Food gives everyone who enjoys cooking access to essential French cooking traditions and techniques and helps them give free reign to the intuition and spontaneity that lie in the heart-and stomach-of every good cook. It will take its place on the shelf right next to Julia Child's Mastering the Art of French Cooking. James Peterson has taught professional and home cooks at The French Culinary Institute and Peter Kump's New York Cooking School (now called The Institute of Culinary Education). A French-trained chef and former owner of a highly acclaimed French restaurant in New York, he is also the award-winning author of: "SAUCES" (Winner, 1992 James Beard Foundation); "SPLENDID SOUPS" (Nominee, 1994 James Beard Foundation); "FISH AND SHELLFISH" (Winner, 1997 International Association of Culinary Professionals); "VEGETABLES" (Winner, 1999 James Beard Foundation); "ESSENTIALS OF COOKING" (Nominee, 2000 International Association of Culinary Professionals and Nominee, 2000 James Beard Foundation); "SIMPLY SALMON"; "SWEET WINE."